My old site launched in 2003 (same domain but now on a different host) was built using FrontPage2002 (UGH - I know). It began to severely lose traffic due to the various Panda / Penguin stuff + the new html5 hierarchy. Over the last year I meticulously rebuilt it using WordPress and then relaunched it along with a sitemap that was submitted to Google Webmaster Tools about one month ago. Of the roughly 4200 different images + the roughly 13,000 urls in the site, almost all have been indexed....took about a month, maybe a little more. I see some of my pages appearing in the search results based on specific keyword terms but still many are way down the results page. I did make all appropriate redirects and am shying away from too many plugins (right now, about 3 are actively running....Yoast, Jetpack and another one) - out of curiousity, is there anything else I ought to be aware of, or do, based on all of this? Am asking if anyone has recently gone through a recent rebuild / relaunch like me. Curious - thanks for any insight / feedback / tips / constructive criticism. Here's the site. I took a peek at the site here and put together some general ideas to consider for your site. I think there are great opportunities with the site and I hope the below gives you some good ideas. I am curious what proportion of your your visitors land on the homepage versus the rest of your site. According to the rankings for your site right now, the homepage has the lions share - this is normal and good. Also, how profitable are the display ads for you relative to the other monetiztion options. As far as the homepage conversions are concerned, I would would rethink the layout. 1 - If that one ad not driving a ton of revenue, I am not sure that it deserves that great real-estate on the homepage. Having the ad there may be damaging user trust before they get to see the shop and so forth. 2 - there is a picture of carton in another part of prime real estate with no call to action, forcing a visitor to scroll down. 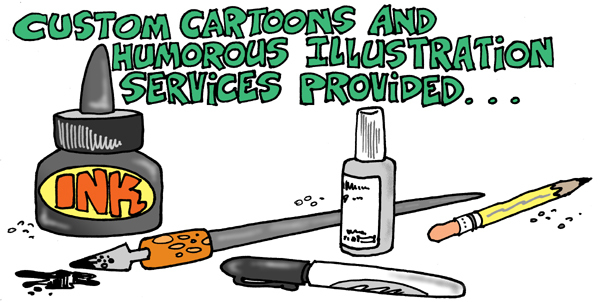 In fact, I think that http://danscartoons.com/wp-content/u...on-service.jpg is a more action oriented picture for that placement. the primary user task should be, which is to search navigation items. POLITICAL - EDITORIAL CARTOONS but it is not linked from the homepage. Link to a bunch of your best off of the homepage. It will help users and in theory, your organic search ranking performance. 6 - In the sidebar, there is an area for 'cartoons are great for' but none of those bulleted list items are not links. Making these pages with links and content would help. 7 - You have a lot of content on your homepage, that is great. There is a nice opportunity to link from the content to other pages on your site, where relevant. 8 - I think that the concept of cartoons for professional project is a such a fun theme. I think that there is a great opportunity in social - especially places where there are image heavy experiences such as pinterest and tumbler, according to a quick check, you don't have accounts there. there are also other places you have not claimed your brand, I recommend registering your brand everywhere, even for brand protection. This page (http://danscartoons.com/cotd/dailycartoon.php) has 14 linking root domains pointing to is but is blocked by robots.txt unblocking it should net yours site 14 extra linking root domains, which should also help. Hi WR: Yes, I have had mucho experience illustrating rabbits, and could assist you in your needs if you advise how your image may be used. As a profile pic you mean? I appreciate your creative input greatly. Thank you. As for the proportion of visitors landing on homepage vs. rest of the site: Since my site is actually an image-laden database, I tagged and keyworded a majority of all of the pics throughout the site so searchers land either on those respective toons in an image search or actually on the page where the work exists or the gallery is located in which any specific toon appears - I did name each of them with unique image file names to coincide with what the content relates to. As for landing on the homepage, I let that act as a sort of "directory" or source that takes the visitor over to those other gallery pages or category pages whereby all categorized toons are located (see link Cartoon Catalog) in top menu that offers the drop down page or this inner page that's linked directly from within the first paragraph beneath my daily image. All the best for relaunching your site. Thank you for your insights! Let me ask this....go to top far right of menu on my index page ("Cartoon Catalog"). See the drop down list? That takes visitors to just over 50 different categorized pages of images I've cataloged throughout the site. Instead of those being in just a drop down list, would it be advisable to include them as a visual list of keyworded anchor text hyperlinks? I mean for SEO purposes?